Altocumulus statiformis are the thinnest form of altocumulus cloud and are normally found at the highest levels of the mid-level clouds. The altocumulus stratiformis clouds are formed by water particles that have been able to be carried into the middle atmosphere. Ground winds carry the water particles up into the higher atmosphere where the higher level winds can carry them in another direction this is known as wind shear and its effect explains their particular shape. What are altocumulus stratiformis clouds? Altocumulus stratiformis clouds are a type of altocumulus clouds that typically indicate that weather is either changing from good weather to more unstable conditions, or having experienced a period of bad weather they are the last clouds to be seen as the unstable weather front passes on. They are the thinnest of the altocumulus cloud types and appear in the form of sheets or even like lumpy jet trails. How are altocumulus stratiformis clouds formed? They are formed by two different weather effects. First of all the ground winds stir up water particles that are carried up to higher altitudes, the winds at the ground level need to be relatively gentle to allow the water particles to be carried beyond the lower altitude levels where cumulonimbus clouds would form. However having reached medium altitudes strong cross winds drive the water particles and form them into the different altocumulus clouds that we can see. These strong winds often with one wind current driving against the other create the different altocumulus clouds that vary from being benign for planes and pilots to those that should be avoided at all costs, such as altocumulus castellanus. 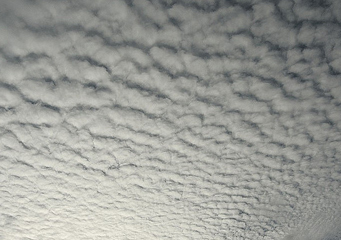 What height are altocumulus statiformis clouds found? How common are altocumulus stratiformis clouds? This type of cloud is quite common and can be seen all over the world. They are best seen when there are relatively quiet conditions on the ground leading to a gradually rising convection of water particles that are carried into the mid-level altitudes. If the conditions are right where the strong winds stop the water particles being carried to the high altitude levels, they will be trapped at any altitude from 6,000 ft to 20,000 ft. Essentially the higher they are carried the more benign they are and less likely to cause bad weather. However the appearance if altocumulus stratiformis clouds will indicate, that like other altocumulus clouds that conditions are changing and bad weather may be on its way.